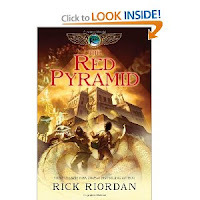 The Red Pyramid is the first book in Riordan’s new Kane series. After finishing the Percy Jackson books I was really excited to find out that he has this new series as well. The book centers around the two Kane teenage siblings; Cater, who grew up traveling with his father, and Sadie who grew up in London with her grandparents. Pushed together by a series of tragic events, Sadie and Carter find themselves in a world-wind adventure. The book is very fast paced, I felt like I couldn’t catch my own breath before something else was happening or someone else was trying to deceive the Kane siblings. I wish that we could have had at least one chapter or two of “background” before they all took off on the adventure. There is a lot of action, which is great, but in this case it almost made me feel rushed. I would have liked it if the kids could have had a few more breaks so we could all catch our breath. Unlike Percy Jackson, The Red Pyramid follows the Egyptian Gods. I think if you enjoy Percy Jackson, Harry Potter, Fable Haven – or any young adult mystical/magic reading then you will overall enjoy this series. I don’t believe it will be my favorite out of this category, but certainly not my least. I am looking forward to where book two takes us!